Please select a name from the list below to view the Egyptian god’s description. The god of the sun, Ra was the first pharaoh of the world, back in the days when gods inhabited Egypt. Each day, Ra’s golden sun ship would sail across the sky, and each night it would travel through the underground world of the Duat, sailing the River of Darkness, and fighting off monsters. The Egyptians celebrated each sunrise, when Ra emerged victorious again and caused a new day to begin. After many centuries, Ra became old and senile, and retreated into the heavens, giving up his throne to Osiris. 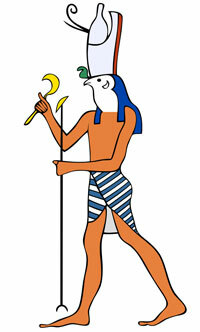 The god of the earth, Geb was one of the first gods to appear from the sea of chaos at the beginning of time. He appears as a man made of earth, with rivers, forests and hills across his entire body. Nut was Geb's wife, the goddess of the sky. Yes, we know she’s got a funny name, but she was not the goddess of peanuts. She appeared as a woman with skin like a starry sky, dark blue and covered in constellations. 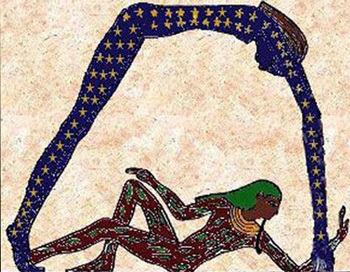 She is often pictured stretching over Geb, as the sky stretches over the earth. Although Geb and Nut loved each other very much, Ra had a prophecy that their children would try to overthrow him someday, so Ra did his best to keep them apart. 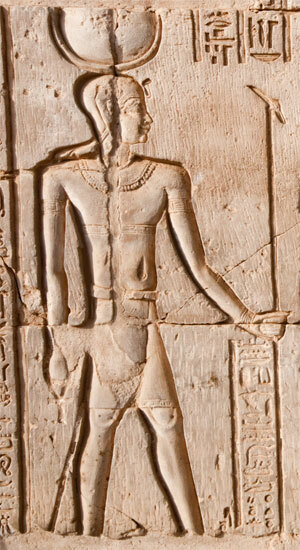 Despite this, Nut managed to have five children, and the oldest, Osiris, did indeed take over the throne from Ra. 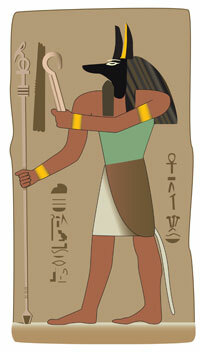 Nut’s father, the god of the air, was given the job of keeping Nut and Geb apart. This is why the sky is so far above the earth. The god of the wind stays between them, keeping his daughter from visiting her love the earth. Shu is usually not pictured, because he is invisible like the wind. 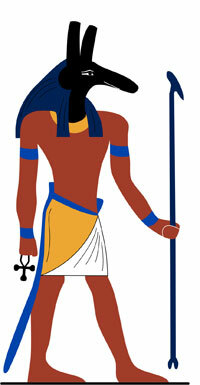 The first son of Geb and Nut, Osiris was a wise and good pharaoh when he took over the world from Ra. Osiris taught man about farming, and created the first cities in Egypt. Unfortunately, Osiris’s brother Set was jealous of him. Set tricked him into laying down in a golden coffin, then sealed the coffin and cut it into pieces. Set scattered the pieces all over Egypt, and Osiris’s wife Isis spent years searching for them. Eventually, Isis put her husband back together, binding him in cloth to make the first mummy, but Osiris only came partially back to life. After that, he was the god of the underworld, sitting in judgment over the souls of the dead. He appears as a king with blue skin and white robes. Osiris’s wife was the goddess of magic, and clever and ambitious woman. She tricked Ra into retiring by poisoning him with a magic snake, then encouraging the old sun god to reveal his secret name so Isis could cure him. Once Isis knew Ra’s secret name, she could force him to do just about anything. She encouraged him to retreat into the sky, opening the throne for Osiris. Isis was the patron of magicians, and loved her husband very much. She encouraged their son Horus to take vengeance on the evil Set, who had killed Osiris. 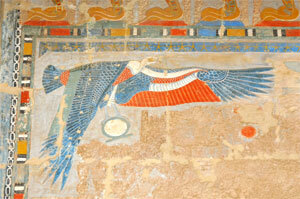 Isis is often pictured as a beautiful woman with multicolored wings. The god of the desert, storms, and evil, Set was one mean dude. His color was red, the color of sterile soil and the desert. Set was the strongest of the gods, and very tricky. He became pharaoh of Egypt after killing his brother, but was later overthrown by his nephew Horus. After that, Set fled into the desert, where he controlled all the evil harsh lands outside the Nile Valley. Set wasn’t all bad, however. In the old days, he sailed on Ra’s boat and helped defend the sun god from the armies of the chaos serpent Apep. Set is usually pictured with red skin and the head of an unknown animal demon – part dog, part anteater, all ugly. The river goddess, wife of Set and the sister of Isis. Nephthys didn’t like her husband very much, because after he killed Osiris, Nephthys helped Isis collected his pieces and bind them together. She was a kind and gentle goddess, and mother of Anubis, the god of funeral rites. 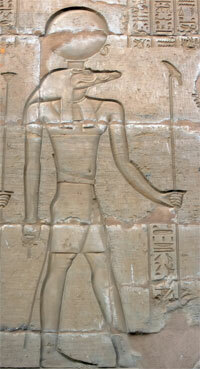 Called the Avenger, Horus was the son of Isis and Osiris. When he grew to manhood, he challenged Set and eventually defeated him, becoming the new pharaoh of Egypt. Afterwards, all mortal pharaohs considered themselves to be the descendants of Horus. 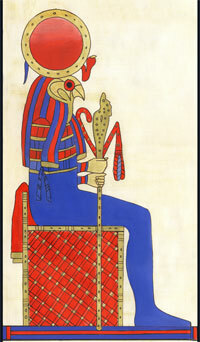 Horus’s symbol was the falcon, and he is often pictured as a man with a falcon’s head. 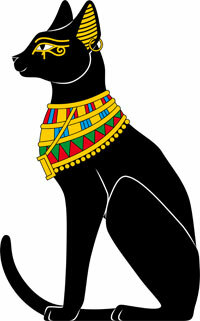 Cats were extremely popular in Egypt, because they could kill snakes, scorpions, and other nasty creatures. Bast, the goddess of cats, was just as popular. Bast was a protective goddess, and people would wear amulets with her likeness for good luck, especially during the bad luck Demon Days at the end of each year. In cat form, Bast is often pictured with a knife, fighting the chaos serpent Apep. She was Ra’s faithful cat. The god of crocodiles was both respected and feared. Crocodiles were strong creatures. In ancient Egypt, an entire city was named after them: Crocodilopolis, and Sobek had a temple with a lake full of crocodiles. However, crocodiles were fearsome predators, and many Egyptians were killed each year if they got too near the river. 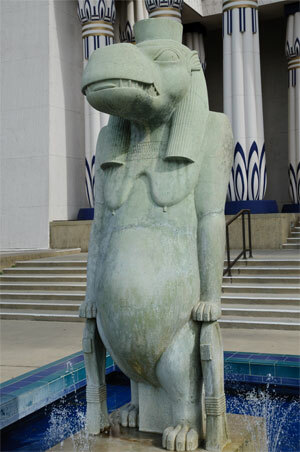 Sobek was pictured as a crocodile-headed man. His sweat was said to have created the rivers of the world. Yuck! The goddess of scorpions was both good and bad. She could send scorpions after her enemies, and a single scorpion bite could kill you. On the other hand, you could pray to Serqet for protection from poison, and sometimes she was seen as a guardian of children. She was pictured as a woman with a giant scorpion for a crown. How’d you like that on your head? Anubis the god of funerals was one of the most important gods, because he helped prepare the soul for the Afterlife and escorted the dead to the hall of judgment. The Egyptians noticed jackals hanging around their graveyards, so they decided jackals must be Anubis’s sacred animals. Priests even wore jackal masks when they made the pharaoh’s body into a mummy. Anubis helped Isis make Osiris into the first mummy. Anubis is usually pictured as a man with a jackal’s head, leading a departed spirit through the Duat. Bes is god of dwarves, protector of households, mothers and children. 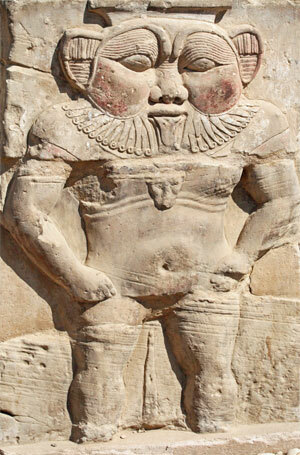 One of the ugliest and most popular gods in Ancient Egypt, Bes had the power to scare off evil spirits. He often appeared on amulets and in sculpture as a hairy little man with a lion-like mane and a pug nose. Egyptians believed that dwarves (and other people who were born different) were inherently magical. Bes was considered extremely good luck. He watched over the common man, children, women in childbirth, and anyone else who needed protection from evil. Khonsu, the god of the moon, loved to gamble. In fact, he once lost five days of moonlight to the sky goddess Nut in a game of senet, which allowed Nut to give birth to her five children. Sometimes, Khonsu is depicted as a hawk-headed god, but more often he looks like a young man with a side-lock of hair, like an Egyptian youth. His favorite color is silver. Nekhbet is the goddess of vultures. One of the oldest goddesses of Egypt, Nekhbet was a patron of the pharaoh, and is often pictured with her wings spread over the king. Her shrine was in Nekheb, the city of the dead, where she oversaw the oldest oracle in Egypt. Like all vultures, she preyed on the dead and dying. If you see Nekhbet hovering over you, start dancing! Let her know you’re still alive! 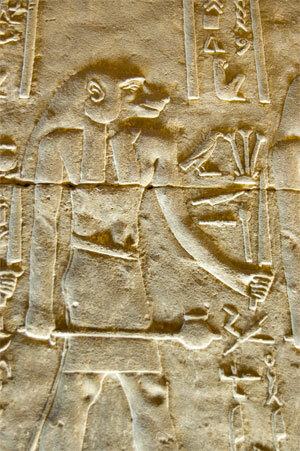 Unlike the wise baboons of Thoth, Babi was the god of wild baboons, especially alpha males. He was aggressive and bloodthirsty, and was given the job of eating the wicked dead in the Underworld. He especially loved entrails. Yum! Babi is definitely not a primate you want to fight. Tawaret is the goddess of hippos. While the Egyptians were scared of male hippos, they saw the female hippo goddess Tawaret as a gentle protector. She looked after pregnant women especially, and is often depicted with a swollen belly. Like Bes, she could scare off evil spirits. In fact, in many stories Tawaret is the girlfriend of Bes. What a cute couple!